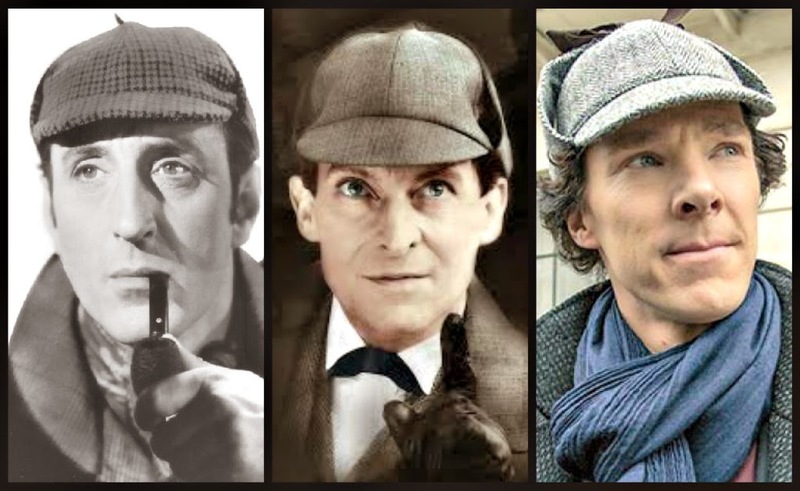 Who's the best Sherlock Holmes? The list of Sherlock Holmes interpreters is impressive. On screen, the character of the world’s first consulting detective, one of literature’s great creations, has been essayed more than 300 times. Mysteries featuring the master of deduction are always popular -- and money-making -- enterprises. Sherlockian aficionados are eager to consume any new iteration of the character – sometimes to the point of consuming some very badly done drama, or even wandering into quite original post-Conan Doyle plots. It’s a tribute, in fact, to the strength of the character that he seems to have escaped from the confines imposed by his creator and now inhabits all manner of newly written stories. Approximately 100 different actors have donned the deerstalker’s cap since 1905, when Gilbert A. Anderson, better known as the original movie cowboy hero “Broncho Billy,” played him. Since then, almost any actor tall, lanky, and/or hawk-nosed (and many who were not) has essayed the role. Among them are John Barrymore, Raymond Massey, Christopher Lee, Ian Richardson, and Robert Downey Jr. – the last a rather diminutive incarnation. George C. Scott, John Cleese, Peter Cook, Michael Caine, and Nicol Williamson have brought off Holmes in canon variants and parodies. Those who have been popularly identified with the role, though, are few. These are Elle Norwood (two features, 42 shorts); Arthur Wontner (five films); Ronald Howard (one TV series); and Peter Cushing (one feature, one TV series, one TV movie). However, I can single three gentlemen in particular who have succeeded in making this difficult personality work on screen. Why difficult? Because Holmes inhabits a unique and contradictory psychological space. On the one hand, he is a master of emotionless logic – a thinking machine who through sheer force of will and discipline has rendered himself heroically unsusceptible to the vagaries of normal, muddy human behaviors. On the other, he is passionate – about his areas of expertise, and as a defender of victims, the wrongly indicted, and the social fabric itself. The three present three distinctly different takes on the character, each of which possesses its own hypnotic charm and internal logic. If you know little about Holmes, watch these three at work and you will result in a fine multidimensional grasp of Sherlock’s nature. If you are an insufferable Baker Street loiterer, you can watch these over and over with some sense of satisfaction. Rathbone must have been glad for the change of pace. After extensive training in classical theater, he made the move to films in the late silent period, and was soon typecast as a villain. Roles such as Pontius Pilate (“The Last Days of Pompeii”), Mr. Murdstone in “David Copperfield,” the wily pirate Levasseur in “Captain Blood,” Tybalt, and most notably Sir Guy of Gisbourne in “The Adventures of Robin Hood” made his reputation as an assured, articulate, and self-possessed nemesis. When 20th Century Fox decided to take the plunge and mount “The Hound of the Baskervilles,” Rathbone’s physique and poise made him a natural for the role. Paired with plump, amiable character actor Nigel Bruce as Dr. Watson, the film was such a hit that it initiated a partnership on screen and radio in these roles for seven years. The series moved to Universal after two outings, and were released as sub-90-minute outings paired in a double feature, usually with an Abbott and Costello movie. The second-to-last entry, “Terror by Night” (1946) clocks in at an astonishing 60 minutes. In 14 feature films of gradually declining quality, sustained primarily by Rathbone’s charisma and long-time director and producer Roy William Neill’s proto-noir style, the Holmes persona was transported to contemporary times and fought Nazis as well as more typical antagonists such as Professor Moriarty, Col. Sebastian Moran, and the like. In the last outing, “Dressed to Kill” (also 1946), his quacking like a duck to relieve but who only further terrifies a frightened little girl, makes him look like a deranged child molester. For insurance, Dennis Hoey, actually a good actor when given a chance, plays Inspector Lestrade with all the Cockney “Gor blimey, now see ‘ere, Mister ‘olmes” brio he can muster. Between these two the Three Stooges would shine like savants. Rathbone’s profile, posture, precision of speech, and quite literal down-the-nose look at others pushes him into a heroic, intimidating mode of infallibility. In a telling joke inserted into the bizarre 1943 Olsen and Johnson film “Crazy House,” Rathbone states badly, “I am Sherlock Holmes. I know everything.” This is the basis of his appeal. Rathbone tired of the role after nearly a decade. He felt that he had done all he could, and was bored. He went to other roles, winning a Tony as Dr. Sloper in “The Heiress” in 1947, the year after his Holmes career ended. Later, his classical training and declamation was used a series of horror films – good, bad, and indifferent. A clinically bipolar actor might seem to be a good deliberate choice for Holmes. However, Brett’s medical condition was irrelevant. His talent was undeniable; he could play Macbeth and Freddy Eynsford Hill in “My Fair Lady,” and everything in between. He fit the bill physically – coming as close as anyone has yet to matching Sidney Paget’s original illustrations of the sleuth. Yet it’s his intense and theatrical demeanor that distinguishes this Holmes from all the phlegmatic previous performances. Brett’s Holmes is erratic, unstable – barely in control of his impulses. He plays up Holmes’ insufferable qualities – the insulting, obnoxious, cantankerous aspects. It’s as if his acute awareness makes everyday life unbearable to him. He is sallow, gaunt, twitchy. At the same time, this TV series would attempt to adhere with diligence to the Conan Doyle canon, resulting in the most faithful set of Holmes adaptations to date. (The series would slip as it progressed through four iterations over a 10-year span.) Supported initially by David Burke as Dr. Watson, and Edward Hardwicke in seasons following, this Holmes was given a companion of the level of intelligence that befitted the original narrator of the tales. So Brett balanced his desire to embody Holmes with a precise fidelity with an ability to make the character fresh and spontaneous again. Brett was unafraid of the extremities of his characterization, and it makes him compulsively watchable. That there were elements of Brett’s personal struggle with mental illness in his work is more a tribute to his professionalism than an endorsement of Method technique. Heart trouble aggravated by chain-smoking, as well as the side effects of the lithium he took to combat his depression, weakened him considerably and led to his collapse during filming the final series. He was “shot around” for many of these last episodes, with Charles Gray filling the gap as older brother Mycroft. Brett ends up as both the definite and the most unorthodox Holmes yet, as the same time – not a small feat. Steven Moffat and Mark Gatiss’ re-conception of Holmes in the present day is intended to be an antidote to what Gatiss called the “too reverential and too slow” traditional approach to adapting Holmes for the screen. The success of this still-developing series is due to the co-creators’ wit and boldness. Enough aspects of the original are retained to anchor the knowledgeable, but the opportunities provided by using modern technology, geopolitical cynicism, and a post-911 sensibility are exploited. Cumberbatch’s Holmes is a self-avowed “high-functioning sociopath,” quite young for the role and possessed of autistic traits, such as lack of empathy and intense focus on a limited number of topics (although his verbal facility is untouched and he is quite capable physically). Cumberbatch brings a refreshing sense of fun to the proceedings, cheerfully self-absorbed and delighted to expose the lies of the system as well as those around him. He is fortunate in his companion. Martin Freeman, in danger in the past of being cast as a nebbishy loser (he broke out in the original British production of “The Office”; Arthur Dent in the film version of “The Hitchhiker’s Guide to the Galaxy), has advanced to more heroic material in this and in the new “Hobbit” films as Bilbo. His Watson is lucid, hard-bitten, and complex, although given to much more deadpan humor and weary takes than Watson has been through before. Above all, this series is much more emotionally complex than any previous Holmes presentations. Serious issues of friendship, family (Mycroft is here, given much more time onscreen; Holmes is actually given parents, and normal ones at that), ethics, fidelity, and responsibility take the foreground, even if set against satisfyingly intricate plots and maddening cliffhangers. This “Holmes” is grounded in relationships. The skyrocketing popularity of the series have pushed Cumberbatch and Freeman into job opportunities and pay grades that may make further series difficult, although one is confidently chalked down for 2015. Will its innovations begin to turn stale, especially for its charismatic lead player As with Rathbone and Brett, only time will tell.